Perhaps the worst-kept secret in F1 this season (apart from Alonso’s move to Ferrari) has been that Rubens Barrichello and Nico Hülkenberg will be driving for Williams in 2010. Today it was finally announced. Historically, Williams has been a team that has been all too happy to dispense with even their best drivers. The fact that they held on to Nico Rosberg for four seasons is possibly a sign that they have learnt their lesson — that exchanging World Champions for the likes of Heinz-Harald Frentzen or Ralf Schumacher is not a championship-winning approach. Nevertheless, Joe Saward has speculated that Williams are not too jazzed about Nico Rosberg, which is why they have no problems letting him go (presumably to Brawn). This is strange if you ask me, because 2009 has been the season when I was finally convinced that Nico Rosberg has some talent. In my mid-season review I ranked Rosberg in 5th, and I doubt he’ll be much lower in my end-of-season rankings. But the decision to partner their protégé Nico Hülkenberg, who Williams have been grooming for the past few years, with Rubens Barrichello looks like a very mature move. I would say that this partnership is possibly stronger than any they have had since the mid-1990s. He then spent two seasons in Formula 3 Euroseries. He finished 3rd in his first season. But although he clinched the title in his second attempt, I would have argued that he did not need another F3 season to justify a presence in GP2. When he finally made the step to GP2, he impressively won the title at his first attempt. In the process, he beat several more experienced drivers including two who have already made the move to F1 — Romain Grosjean and Kamui Kobayashi. We have seen too many times that success in lower formulae is no guarantee of success in F1. No Formula 3000 Champion ever went on to become an F1 champion (although Lewis Hamilton did become a GP2 Champion on his way to F1). I do, however, feel that Hülkenberg is a seriously exciting talent. By pairing him up with Rubens Barrichello, Williams have ensured that he will have every opportunity to succeed. In essence, they have given this hugely promising rookie the best mentor in the world in the shape of the most experienced F1 driver of all time, Rubens Barrichello. It is no secret that Jenson Button owed a lot to Barrichello’s set-up data this season. The Brazilian’s experience makes him an expert at setting up the car. He can now pass his wisdom on to a true rookie — one who will surely truly appreciate the help. I am sure it is help that Barrichello will be more than happy to provide. He is clearly a nice guy. And in the knowledge that he is in his final year or two of F1, helping cultivate a new talent may well appeal to him. 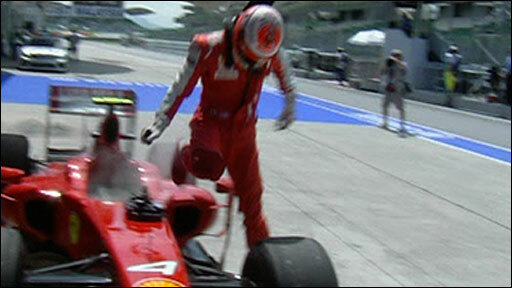 It is, after all, what his former team-mate Michael Schumacher did with Felipe Massa. The two together make for an interesting proposition and one I’m definitely looking forward to. The experience of Barrichello and the enthusiasm of the ‘next best thing’ in Hulkenberg put Williams in good steed for 2010, I just hope the Cosworth engines don’t let them down. And of course, Frank Williams’ other driver this year was Nakajima, whose presence on the team presumably reduced the price of those Toyota engines considerably. Bernie’s enthusiasm for the young Rosberg almost certainly had a financial component as well… A famous name for a generation of older (my age), now-successful investor-businessmen who cheered Dad in the 1980’s. Frank Williams is what they call a privateer, right? This isn’t meant to give him a hard time, just to point out that Nico’s presence on that team might always had as much to do with dear sponsorship money as anything else. Nico is said to be an old friend of Hamilton’s, but then so is Heiki, and he was only good for a single win when McLaren was at the peak of their powers in ’07. So who would you prefer to see beside Lewis next year? Kimi would make a wonderful contrast in personalities… I can imagine that Lewis would get (competitively) pissed off at Räikkönen every weekend, as the Brit greeted the sponsoring businessmen for mundane chitchat in the motorhomes, while the reticent Finn pursued parties of his own. Seriously, I think this is a good move. The only *possible* fly in the ointment is the Cosworth engine. I seem to remember it was a piece of **** last time around. Errorcheck: Heiki won one race for McLaren (Hungary) in 2008, not 2007.